On 11 August, chef Victoria Elíasdóttir and her brother, artist Ólafur Elíasson, will open a culinary space in Reykjavík, hosted by the Marshall Restaurant + Bar. 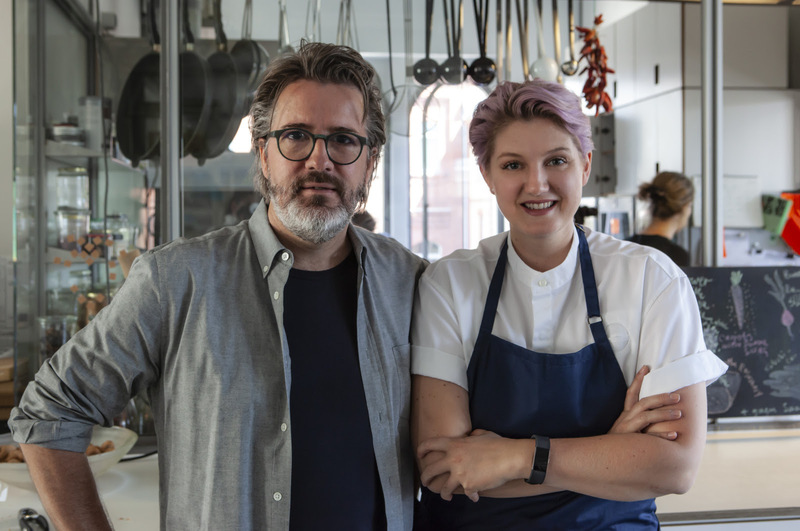 Running for almost three months, the temporary restaurant will serve lunch and dinner, inspired by the atmosphere of the Studio Olafur Eliasson (SOE) Kitchen in Berlin. The project will bring the SOE Kitchen to Reykjavík creating a space for eating and thinking, for food experimentation and impromptu encounters, in direct response to the Icelandic context. To create a unique atmosphere, artworks by Elíasson will be installed in the restaurant which lies adjacent to his satellite studio at Marshall House. Victoria Elíasdóttir and the SOE Kitchen invite guests to take a seat at a long table to share healthy food and conversation – much in the spirit of the daily lunches that are served family-style to Elíasson’s 100-person studio team in Berlin. Elíasdóttir takes on this new project after having completed a successful stint as chief chef in acclaimed Berlin-restaurant Dóttir. With the SOE Kitchen team, she will prepare a special menu that combines locally sourced ingredients and recipes popular with the Berlin studio team. While the SOE Kitchen prepares organic, vegetarian meals in Berlin, the temporary restaurant at the Marshall House will take advantage of its location at the harbor to offer a special selection of fresh seafood and fish. The restaurant will serve a set meal of the day for lunch and a dinner menu in the evenings. On selected evenings, guests are invited to stay after dinner for a series of events – conceived by Studio Olafur Eliasson with the participation of i8 Gallery, Mengi, and other local collaborators – that range from micro-concerts to poetry readings and include experimental jazz, electronic, or vocal arrangements. Futhermore the program includes performances and talks with artists, composers, philosophers, social scientists, and cooks, as well as activities for children. Text and image via I8gallery, Reyjkavik.